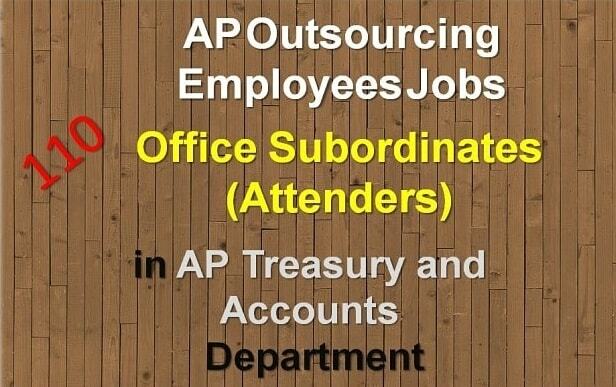 AP Outsourcing Employees Jobs In AP Treasuries and Accounts Department - (110) Office Subordinates (Attenders). The Director of Treasury and Accounts Department located in AP., Ibrahimpatnam nearer to Vijayawada has informed to the Government stating that the department has (349) Subordinate Offices in (13) Districts in the State. And (110) Office Subordinate posts are vacant. In the Government Offices earlier Office Subordinates were called to be Attenders. Now the designation nomenclature has changed as Office Subordinates. What is the Office Subordinate work in the Treasuries and Accounts Department? The Office Subordinate has to carry the locked trunk box containing passed bills/cheques twice a day from Treasury to Bank. He has to trace and take out the "Pension Paper Orders" from the strong room between the dates from 01 st November to 31st March every year for the purpose of PPOs annual verification certificates. Daily accounts sheets to be carried from Sub-Treasury to District Treasury every day. The works are pending due to Office Subordinates are not appointed in the (13) district with full strength. So it might be the cause of the work disturbance in the treasury offices. The Treasury department authorities have requested the Government for the appointment of (110) Office Subordinates on an outsourcing basis. Because the regular appointment will take many days. By considering the facts the department has sent the proposal for filling up of (110) posts in all (13) district on an outsourcing basis. 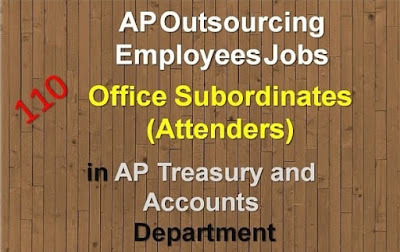 The AP Government has examined the proposals sent by the Director of Treasuries and permitted the Director of Treasuries and Accounts, A.P., Ibrahimpatnam to engage (110) office subordinates on outsourcing basis against the sanctioned posts in the district treasury offices and sub-treasury offices located in all over the state duly following outsourcing guidelines carefully. Salary: An Outsourcing Person with this category should get consolidated pay Rs. 12000 per month. How to contact with AP Treasury and Accounts Department? This office is located at Ibrahimpatnam which is nearer to the Vijayawada city. It would be 15 km distance. How I apply this job please provide contact and details. Awesome Blog, Thanks for sharing helpful information. Telangana Electricity Department TS Northern Power Distribution Company Limited released Direct Recruitment Notification for Junior Lineman 2553 Vacancies.